It has been ten years since Tech had a chance at a collegiate world championship, and this season was the third opportunity the team had under head coach Danny Hall. Five years have also gone by since the Jackets were last crowned ACC champions. This could be the season Tech returns to the top. Just under the halfway mark, Tech baseball holds a 21-7 record so far. If the Jackets are able to maintain, and even improve their performance on the field, there could be a place for Tech in the 2016 record book. in at 18th in USA Today’s Coaches poll. Freshman Tristin English is turning out to be a key to the program’s continued excellence. One of two freshman that turned down the MLB Draft to attend Tech, English has become a regular member of the starting lineup. English turned down a 39th round draft by the Cleveland Indians and made his Tech debut in the first game against Purdue. Almost halfway through the season, English is ranked fifth on the team in batting average. 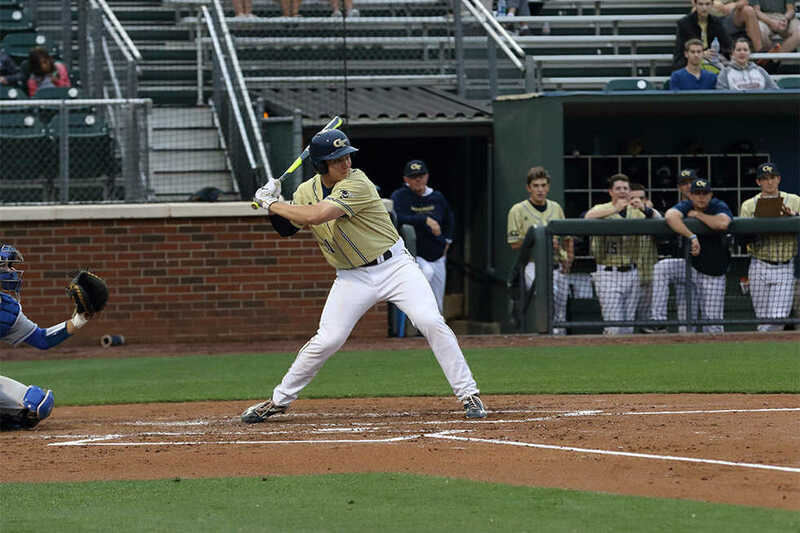 In a 5-2 win against the Boilermakers, English’s savvy at the plate powered an offensive outburst, and he was a major factor throughout the team’s compelling early run of wins. The Jackets experienced their first loss on March 11 against No. 11 Florida State. Though the entire lineup was unhappy with the loss, game thirteen was not disastrous in every aspect. English went 3-for-3 in hits for a career high. Whether it was just an off weekend, or the struggles of being away from their home field, the jackets ended their weekend in Tallahassee with three losses. Tech quickly moved forward and looked to have better future performances. Tristin English’s name hasn’t made it to every headline, but he is a player who has consistently performed well when Tech has needed him most. Fans have seen English many times at bat, but fans have yet to see him pitch out of the bullpen. If English gets that chance to pitch relief for Tech’s starting lineup, there is a sizable chance that he could make himself a stalwart on the mound if the situation demands it. His 1.09 ERA during his high school career earned him the Preseason All-American title by Perfect Game USA last year. Not to mention such a low ERA tops the best ERA posted by the jackets this season. In fact, the lowest ERA posted so far by Brandon Gold, 2.23, is nearly twice that of English’s 1.09. With potentially three and a half seasons left in his collegiate career at Tech, English will have lots of chances to further impress Tech fans. Tech’s entire lineup has been impressive this season. English’s fellow freshmen and MLB draft picks, Joey Bart and Jonathon Hughes, have also become regulars in Tech’s lineup. Bart comes in third in the lineup in overall batting average. Hughes has the second best ERA on the team. Kel Johnson has made some great plays on the field and Gold’s performance on the mound continues to improve as the season progresses, good signs for a team hoping to capitalize on a youth movement. Coach Danny Hall has gathered together a talented roster this year and fans have good reason to keep cheering.